In the last couple of weeks multiple friends have been kind enough to give me pounds of vegetables from their gardens. I have been using the squash to make pasta (post to come later in the week) and the tomatoes to make pasta sauce and a tomato tart. However, my family can only eat so many fresh cucumbers, so I decided to make fridge pickles. I used a 50/50 water vinegar ratio and made the pickles in wide mouth jars. I had five pounds of pickles total, which I sliced into spears and soaked in boiling water with a teaspoon of turmeric for three hours. Then I added the spices to the jars, added the cucumbers to the jars, boiled the vinegar, water, sugar and canning salt and then poured into the jars. Since I don't own a dishwasher I always boil my jars and lids for ten minutes before using. Stick in the fridge and your done. I normally wait about five days before tasting, to make sure the full flavor of the pickles comes out. 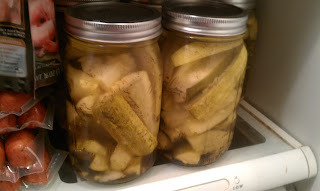 Fridge pickles are a great way to save money, especially since my two boys eat a large amount of pickles. They are easy to prepare and you need no previous canning experience since they don't need to be water bathed. Pickles are a great way to use extra garden veggies before they go bad and taste delicious. I love home canned pickles. My grandmother used to open a jar every time I came for dinner because she knew how much I liked them. Store pickles just don't cut it. I can't wait to read about the squash. great idea! I've never thought about doing this! I love pickles. And I tried making pickles a couple of years ago and nothing happened. The cukes didn't pickle. It was a bummer to say the least! @simply life They are really easy and taste delicious! @E Did you use store bought cucumbers? If so they have a wax on the outside that the vinegar can't penetrate so they won't pickle. Canning can be hit or miss sometimes, I bet if your tried again with a better recipe they would turn out yummy! Loving the DIY attitude you have! All of the recipes look amazing!